Thane Police Bharti 2019 Apply Online– Candidates from the district of Thane can apply online for the recruitment which is to be conducted in the year of 2019 by the Police Dept of Maharashtra for the posts of Constable. This Thane Police Bharti is expected to be conducted in the coming months with a vacancy number of 238 vacancies. The web portal from where we have borrowed this information is the official website of the Thane Police www.thanepolice.gov.in. The official pdf can be found on the other sites of the Maharashtra Police Recruitment which are mahapolice.gov.in/Recruitment and mahapolice.mahaonline.gov.in. 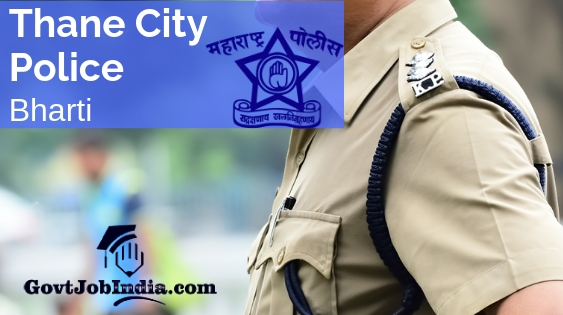 Interested candidates can start their application procedure for the Thane City Police Bharti by checking out the eligibility criteria and the salary scale and all the essential details require for this procedure. So we would recommend that you browse through the entire page given below and check if you suitable for this position. The Maharashtra Police Recruitment is to be conducted across the state in the name of the MahaPolice Bharti 2019. This is an initiative put forth by the state govt for increased employment. This recruitment which is planned to be conducted across the state is Maharashtra is a part of the Mahapolice Bharti 2019 . This big job opening occupies a slice of the Maharashtra Mega Bharti 2019. So, let us start with the details of the recruitment by going through the subparts of the job vacancy. Let us check if you are eligible or not for the Maharashtra Thane Police Bharti 2019. Selected Candidates in this Thane City Police Department, will get a pay scale of 5,200 to 20,200 Rs. (Grade Pay – 2,000 Rs.) with Special Pay 500 Rs. and Other. How to Apply Online for the Thane Police Recruitment 2019? The first step is to go to the official portal of the recruitment board which is -www.thanepolice.gov.in/. Find the link which calls out for the constable vacancy. It will mostly be on the very homepage. Read and browse through the entire Advertisement PDF and see if you are eligible. Now, through that PDF, go to the online application link. Alternatively, go to the link which is provided at the bottom of the section. Fill all the essential information asked in the form and attach the documents required by the system. Now, make the final online payment in order to finish the registration. Click on the submit option at the bottom of the screen and you will be done! Finally, we would advise that you take a printout of the application form and preserve it. Did you find this article about the Thane Police Bharti 2019 useful? Were all the details mentioned along with the format satisfactory? If yes, share this page with all those who might be looking for this recruitment. You might be helping someone out by sharing this page. Furthermore, if you feel that any of the details enlisted below are confusing, then comment below and let us know and we will clear it out as soon as possible. In conclusion, subscribe to our website @GovtJobIndia.com for the latest updates about the newest govt job notifications by entering your email address in the panel above.